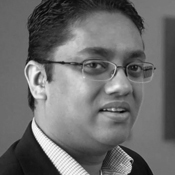 Kes Sampanthar is an award-winning innovator and recognized strategic thinker. He is a prolific inventor and polymath with the audacity to reinvent meaningful experiences. Kes is Director of Media Strategy at Cynergy Systems, the premier technology agency. He is the inventor of ThinkCube – an innovation system, process and game for businesses ? and the founder of MetaMemes – an innovation company.